How did Oculus Go win over Magic Leap? The VR/AR Innovation category was stacked at this year's Wareable Tech Awards. The big players were all represented, from Lenovo's Mirage Solo to the HTC Vive Pro. There were even more exciting efforts from the small guys, including devices like the MagiMask, Mario Kart VR, and North's Focals. And there was Magic Leap One, the secretive startup that finally unveiled what it had been working on these past few years. Yet Oculus's portable Go headset rose above the rest with the judges and the Wareable team. For the past couple of years, virtual reality has been a tale of two extremes. There's been high-quality, expensive virtual reality like Oculus Rift and HTC Vive. You need a powerful desktop computer and a virtual reality rig that takes time to set up. Even PlayStation VR requires hundreds of pounds in investment. On the other side is affordable, low-quality mobile VR. You simple stick your phone into a headset and go. The experience, while fine, is nothing compared to the high-end devices. There's needed to be a middle ground for a while that unlike Samsung's Gear VR wasn't exclusive to Samsung smartphone owners. Oculus' Go was that device. Oculus Go provides a good quality experience that stands a little above mobile VR. It provides a standalone experience that's far more convenient than mobile VR. Getting in and out of VR experiences is far easier, making it more likely that people keep going back to VR. 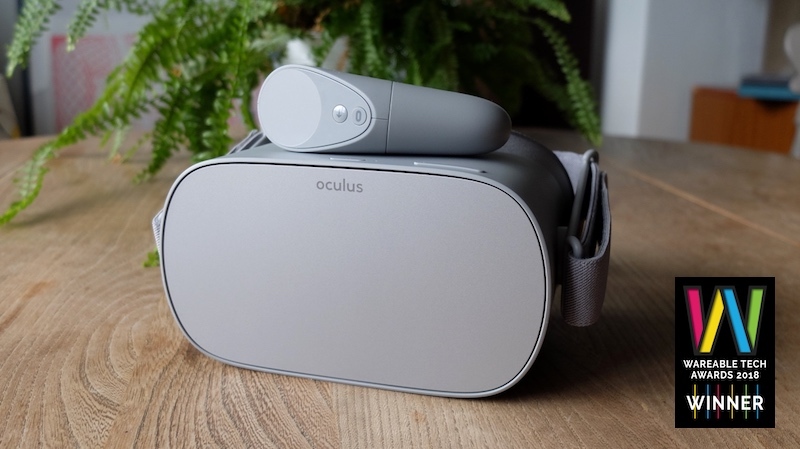 On top of that, Oculus has done a good job – thanks to its partnership with Samsung – in creating great VR experiences for a lower-powered VR headset. You're not getting the high-end experiences of the Rift, but they're still good enough. Finally, and most importantly, the Go's $200 price tag makes it easier for more people to jump into the world of virtual reality. The Go isn't perfect, but it solves a lot of the problems standing in the way of giving VR mass market appeal. And it's also opened the door for the higher-end and more exciting Oculus Quest. Our runner up was the Magic Leap One, the first device from Magic Leap – allowing us to see what all the hype was about. Magic Leap has done a lot right with its first piece of hardware. Its technology shows great promise and it's building up an army of developers, but it's still got a lot of work ahead of it. The experience, right now, is still a work in progress. It's also not available for regular folks to experience, as Oculus Go is. All of these factors and more ultimately swayed us in favour of the Go, and we look forward to seeing what Oculus has in store for us in 2019.